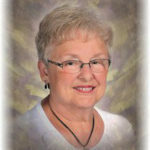 Mavis Poppema, 76, of Sheldon, Iowa, passed away Sunday, Jan. 27, 2019, at Sanford Sheldon Medical Center. Funeral services were Thursday, Jan. 31, at First Christian Reformed Church, Sheldon, with interment in East Lawn Cemetery, Sheldon. Mavis Ruth Uittenbogaard was born Aug. 5, 1942, in Chicago, Illinois, daughter of Martin and Sylvia (Talsma) Uittenbogaard. She lived her youth in Chicago before moving to a farm near Hartley, Iowa, and later moving to a farm near Sheldon. She attended Sanborn Christian Grade School and Western Christian High School in Hull, Iowa. After high school, she worked as a bookkeeper at Moleman Dairy several years. On Oct. 10, 1961, she married Robert Poppema. They lived in Sheldon where they owned and operated Poppema-Sikma Construction. She worked as head cook at Sheldon Christian Grade School and Christian Retirement Home. She later started Mrs. D’s Diner in Sheldon. Survivors include her husband; children, Natalie (Joel) Van Ginkel of Hull, Leah (Dan) Heiliger of Archer, Iowa, Dan (Kathy) Poppema of Sheldon, Mike (Katy) Poppema of Remsen, Iowa; 28 grandchildren; nine great-grandchildren; three sisters, Karen Vis of Valley Springs, South Dakota, Donna (Roger) Poppema of Sheldon and Sharon (Steve) Holz of Sheldon, and one brother, Marty (Dawn) Uittenbogaard of Sheldon. She was preceded in death by a son, Kenny Poppema; her parents; stepmother, Gretta Uittenbogaard; sister, Glenda Van Wyk, and brother-in-law, Marlin Vis.